Everybody can recall at least one memorable dinner party where the combination of delicious food, special people and lovely venue all came together. Gathering to share food has been happening as long as people have walked this earth. Collecting the memory of a memorable dinner party is fun and easy to do. Can you draw a rectangle or circle? If yes, then you’ve got a table shape. Add chairs and the names of who was sitting where. List the food eaten in the middle of the table like a menu. I use a small (discreet) piece of paper to do this while dining. On one side of the paper are details of who, what and where. Inevitably some food bits get on the paper and I am not concerned about being messy as I’m at a party after all and want to be present. On the other side of the page I scribble snippets of conversation – quite hilarious reading on another day. The next day I will recreate the memory from my notes adding it to my journal or putting it on fresh paper. It’s then photographed and sent to the dinner hosts thanking them and maybe helping me get future invitations. Sharing with others who have been around the table is a wonderful way to show people you value spending time with them. 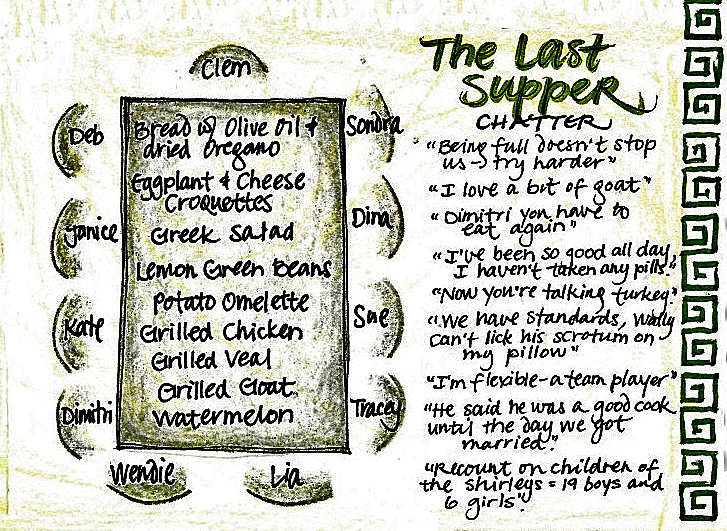 Creating a dinner party memory is one of the ideas I shared at the Inspired Living Summit last month. You can find sketchnotes from all the presentations on my website. I found this great little book recently at Bastion Books, a precious bookstore in downtown Victoria. The book is full of great food stories about history, dinner parties, and recipes with wonderful little watercolour drawings. There is a story for each day of the year. A fantastic idea for collecting food memories. 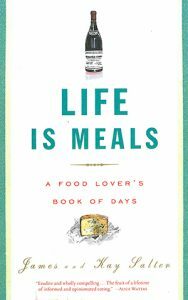 Food plays a huge role in our lives and recipes are regularly included in personal life story projects. The Lozeron family remembers the Fried Saskatoons that everyone looked forward to. Cabbage rolls, Chicken paprikash, Wesa’s Pizza, and a rice pie called Bomba are a few of the recipes we’ve included. Personal stories, family stories often revolve around food and sharing time together. Those memories are important and connect us together. Do you remember a special dinner party where a delicious meal was shared? Why not recreate it and add the recipe to one side in order and share it with others. Need help? Send me a note. Thanks for following along. If you like this blog I would be grateful if you shared it. And if there is something you’d like me to write about please send a note. I’m always looking for ways to help people collect their memories.